This four bedroom Hampton Lakes villa sits conveniently close to a wide range of shops, restaurants and golf courses. 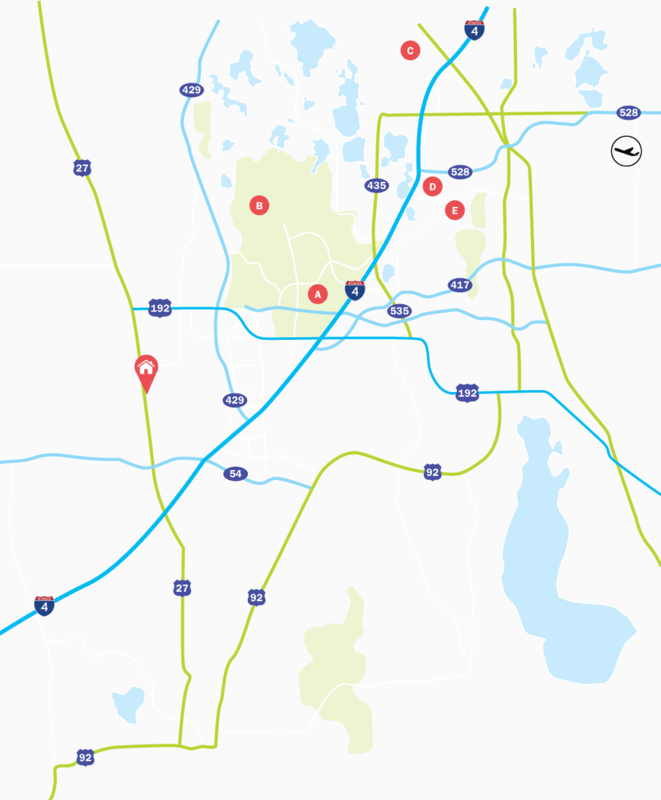 Disney theme parks are a short drive away along the US192 and Universal and SeaWorld can easily be reached along the I-4 highway. King-size bed, walk-in closet, door to pool deck, TV. En-suite bathroom with bath, shower cubicle, double sink unit and separate WC. King-size bed, slide closet. En-suite bathroom with bath, shower cubicle, double sink unit and WC. Two sets of bunk beds, walk-in closet, TV. Family bathroom between bedrooms 3 and 4 with shower over bath, sink and WC. This spacious four bedroom villa on the established Hampton Lakes community in Davenport, is the ideal choice for any family holiday to Orlando. Shops, restaurants and all Orlando attractions are easily reached from here. The spacious open-plan living areas, games room and private west facing pool deck are great features of this holiday home. Living Accommodation - The living accommodation includes a large kitchen with breakfast nook overlooking the pool deck, a dining area in the middle of the villa and a large family TV lounge. Bedrooms - The Master bedroom has a King-size bed, ensuite bathroom and doors leading to the pool deck. Bedroom 2 also has a King-size bed and en-suite bathroom, whilst the third bedroom has twin beds. The fourth bedroom has been furnished with two sets of bunk beds. Outdoor Living - The west facing pool deck, with private pool, benefits from having privacy fencing all around, a covered dining area and a gas BBQ for guest use.